Around the world, old barns, factories, warehouses, fences, and railroad ties are getting a luxe second life in the form of a mirror here, a barn wood vanity there, and plenty of accent walls along the way. While this bathroom design trend may have begun for environmental reasons, its warm good looks ensure its popularity will continue to climb. 1. Character. No two pieces are alike. Due to its history and age, reclaimed wood is often deeply textured and distinguished by visible wear marks and nail holes. In fact, Bordeaux, a wall-mounted bathroom mirror made from repurposed wine barrels from our Vintner’s Collection bears the original barrel maker’s stamp—making this work of art special. 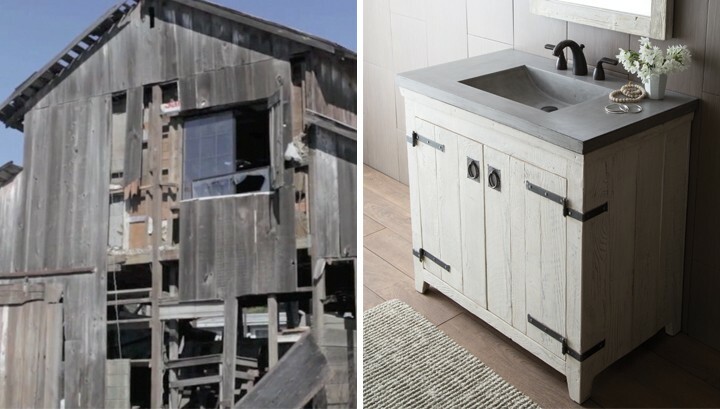 Old wood structures of the past can be given a new life, such as a dilapidated barn that is artistically transformed into bath furniture. 2. A story to tell. Along the same lines as our first point, much of the salvaged wood being used today comes with a story that homeowners and designers love to tell and retell—whether it’s of the dilapidated barn upstate where the beautifully weathered barn wood was harvested or of a renovation project during which a home’s original wood was salvaged and then up-cycled. 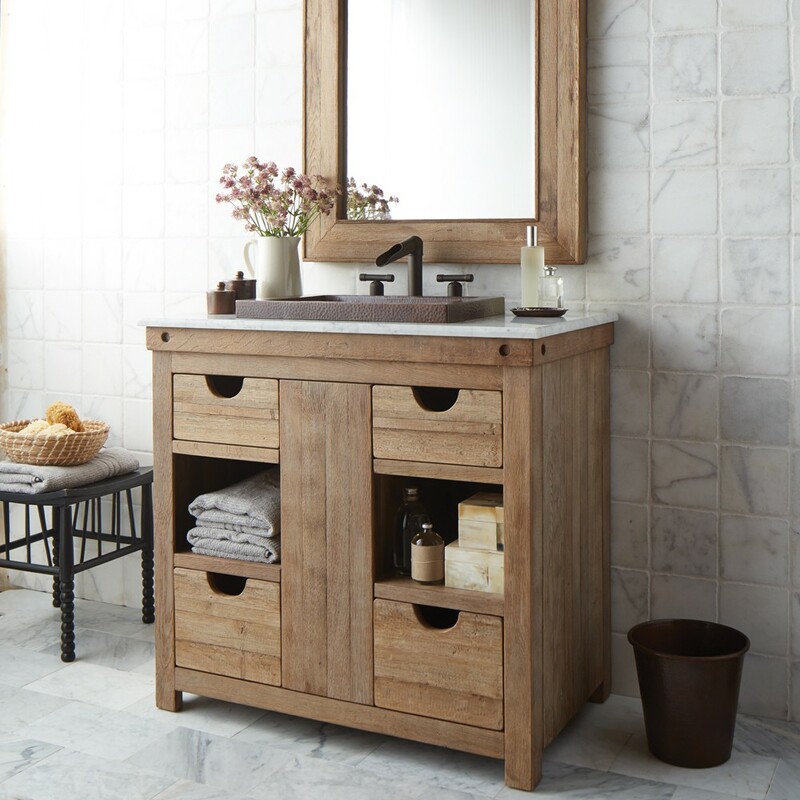 The tacit knowledge of a former “life” adds depth of character to bathroom pieces made from reclaimed wood. 3. Not just reclaimed— re-purposed, too. The most enchanting pieces are those that don’t stray too far from their original purpose. 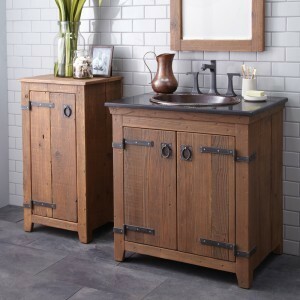 Our wine barrel vanity is one of the most talked about forays into recycled wood. This wall-mounted wine barrel vanity is made from an oak wine barrel that has outlived its original five-year lifespan. Artisans disassemble the barrel, cut it down to the ideal size, reassemble the slats, and wire brush the oak to remove residuals from the winemaking process. 4.Mother Earth will thank you. Reusing timber that would otherwise be discarded not only keeps it from going to landfill but preserves forests by preventing the same quantity of virgin timber from being harvested. Moreover, processing salvaged wood has a lower impact on the environment compared to the felling, transporting, and processing of virgin timber. 5. Often rare or exotic. Reclaimed wood provides a source for a rare, exotic, and commercially unavailable wood species. With the depletion of old-growth trees, the size of available forest wood is generally smaller than what might be available from salvaged sources since the high demand for virgin timber means trees seldom are allowed to mature to their full size. 6. A foolproof farmhouse style. From farmhouse sinks to barn wood décor, easy, unfussy farmhouse style is all the rage with both city and country dwellers who want their homes to feel comfortable and authentic. One of the top ways to achieve this style is to incorporate old barn wood into the bathroom, which is one of the reasons the Americana Collection bathroom vanities are consistently top sellers. 7. A rich, authentic finish. In the case of our Vintner’s Collection vanities and mirrors, even the finishes are original, as the wood oaking staves gain their unique rich finish as a result of soaking in red or white wine for many months. The oak infuses tannins and aroma into the wine while absorbing the color of the grapes, and the natural finish of this reclaimed wood is later enhanced by hand waxing to bring out the color and protect the wood. 8. Texture, contrast, and warmth. In a place where vast amounts of tile can quickly make a bathroom space go cold and sterile, designers often look for something to “warm up” master bathrooms and powder rooms. A salvaged wood wall-mounted mirror and reclaimed wood vanity cabinet fit the bill. 9. Naturally more durable. One of the best things about reclaimed wood. Often exposed to the elements, reclaimed wood pieces won’t be susceptible to the shrinkage and movement of newer wood. The wood has fully dried out, so it will be less prone to warping. And because it is already “aged,” there shouldn’t be any surprises about its durability in the years to come – making it perfect for the bathroom.